June 2013, was again a month of lackluster for Indian Automotive Industry. During the ongoing year, for first six months, we have seen a drop of almost 8-9% and the month of June has only added woes to it. 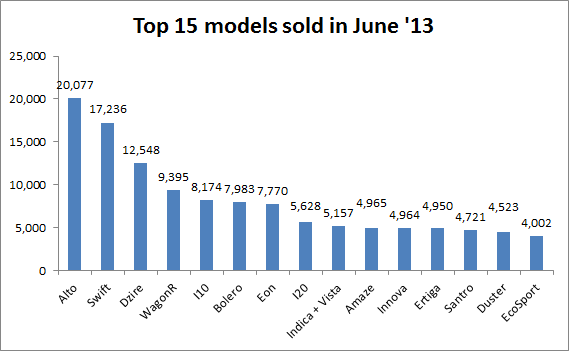 Below are the sales figure of top 15 models sold during the month. You could easily spot that Mahindra's Bolero has touched a figure of 7,983. The last time we saw such a low figure was in July & August 2011. Mahindra's other new cars Quanto, XUV 5OO are just above 1,000 mark and Vibe has nothing talk about either. The yet to be launched low cost XUV 5OO with reduced ground clearance will add to numbers or not - we will have to wait n watch. An interesting fact this month is, Dzire sales + Amaze sales totals the Dzire's last month sales. The sales of last month topper, Dzire has now come down to 12,000 + levels. Seems like Honda Amaze effect has started to be seen on Dzire sales. Ford's EcoSport - clearly the much awaited launch for the year and perhaps should be the best one for the industry in 2013, gathered 4,002 units and not to forget the car was launched on 26th June, just 5 days and dealers picked up all the inventory. More details to be revealed soon.